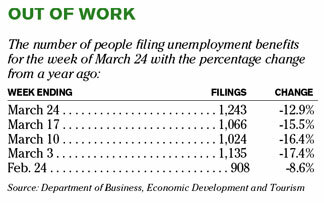 Hawaii's seasonally adjusted unemployment rate rose in February for the second straight month to 2.3 percent from 2.2 percent, even as the number of nonagricultural jobs in the work force increased. The gain in labor was due primarily to 1,200 jobs being added in state government because of the Department of Education's transition to its new school schedule, as well as 300 jobs being added by retailers because of more hiring in Waikiki's new stores, according to data released yesterday by the state Department of Labor and Industrial Relations. cultural jobs rose in February by 1,100 to 624,900 over the preceding month. 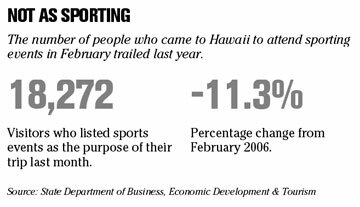 Hawaii's jobless rate, which hit a historic low of 2.0 percent in December, continued as the lowest in the nation for the seventh month in a row. The national jobless rate was 4.5 percent in February, down from 4.6 percent in January. A year ago, the state's jobless rate was 2.5 percent and the national rate was 4.8 percent. Overall, the state's labor force grew by 950 over the previous month to 649,000. The number of people employed rose by 250 to 634,150 while those unemployed increased by 700 to 14,850. Reading International Inc., a California owner and operator of cinemas and theaters, has acquired an 18.4 percent equity stake in Malulani Investments Ltd. for $1.8 million. Honolulu-based Malulani owns about 763,000 square feet of commercial real estate in California, Hawaii and Texas, and roughly 22,000 acres of agricultural land in Napa Valley. The real estate investment company, established in 1924, traces its origins to Abraham Malulani Afong, the sixteenth child of Chun Afong, who was the minister of finance for King Kalakaua. Easton Manson, president of Persis Corp., became the president and largest shareholder of Malulani in 2004. NEW YORK » Time Warner Inc., the world's largest media conglomerate, paid its chairman and CEO Richard Parsons compensation valued at $18.4 million in 2006, according to regulatory filing yesterday. Parsons, a University of Hawaii history student from 1964 to 1969, received a salary of $1.5 million, bonus of $8.5 million and stock and options valued at $8 million, according to the company's proxy statement filed with the Securities and Exchange Commission. Parsons, 58, also received other compensation of $427,174, which included transportation-related expenses of $297,872 and $100,000 in payment of fees for financial services, $8,800 in a savings plan contribution as well as $12,036 to cover life insurance costs. SEATTLE » Hackers stepped up attacks yesterday on computers running some versions of Windows, a day after Microsoft disclosed a hole related to the mouse cursor. HERSHEY, Pa. » Unionized workers at two Hershey chocolate factories voted overwhelmingly today to accept a tentative agreement that would keep the hometown factories open but allow the elimination of hundreds of jobs. The agreement emerged from talks between the Hershey Co. and Chocolate Workers Local 464 in the wake of an announcement by the nation's largest candymaker that it would slash its work force and build a plant in Mexico. As many as 650 jobs could be cut at Hershey, but the agreement would keep open the two plants where they work, including Hershey's century-old flagship factory on Chocolate Avenue.